Archives : A RELIEF RALLY - 18/05/2012. A RELIEF RALLY – 18/05/2012. Nifty finally halted the downslide when it entered the support zone at 4843 – 4777 and made a big white body candle. A relief rally will not be out of place considering that the market was in oversold zone for more than a week. But the important question is can a one day bullish candlestick pattern translate into a pull-back. For the pull-back to materialize, the low made on Friday i.e. Sensex 15809 and Nifty 4788, should not be breached. One needs to remember that this is just a Pull-back, which will not reverse the Bearish trend. Sensex opened the week at 16318, made a high of 16390, low of 15809 and closed the week at 16152. Thus it registered a weekly loss of 140 points. At the same time the Nifty opened the week at 4934, made a high of 4957, low of 4788 and closed the week at 4891. Thus the Nifty went down by 37 points on a weekly basis. On the daily charts on Friday, both Sensex and Nifty have formed a big white body candle which is engulfing previous two days small black body candles. Interestingly in this week there were two Up-days which formed big white body candles and three Down-days which formed small black body candles. Such formations point that the Bearish intensity is getting reduced and the Bulls may be getting ready for a short term price reversal. Weekly candlestick pattern for both Sensex and Nifty is a small black body candle with small upper shadow and a long lower shadow. It could have been a Hammer had the small upper shadow not been formed. The long lower shadow point to the fact there is buying pressure at lower levels. Thus Candlestick patterns point towards an upward price movement in the very short term timeframe. If the upward price movement continues then we will be considering Retracement of the immediate fall from Sensex 18523 to 15809 and Nifty 5629 to 4788. Thus the Pull-back levels for that will be 16846-17166-17487 for the Sensex and 5110-5209-5308 for the Nifty. Both Sensex and Nifty continue to remain below the short term average of 20dma (Sensex – 16747 and Nifty – 5071). Also the indices continue to remain below the medium term average of 50dma (Sensex – 17122 and Nifty – 5201) and the critical long term average of 200dma (Sensex – 16858 and Nifty – 5085). As a result, the trend in the Long term timeframe, Medium term timeframe and the Short term timeframe continue to be Bearish. Market has now gone below the level of the Falling Channel Top which comes in at Sensex 16572 and Nifty 5007. These levels should now provide Resistance for the market. The overall bullish long term target for Falling Channel pattern breakout remains intact. The targets as per this formation are Sensex 20383 and Nifty 6148. Market took support at the Support zone formed by the confluence of 38.2% Retracement of the entire rise (Sensex from 7697 to 21108 and Nifty from 2252 to 6338), 61.8% Retracement of the intermediate rise (Sensex from 13219 to 21108 and Nifty from 3918 to 6338) and the 200 Weeks Moving Average (Sensex – 16029 and Nifty 4819). Thus the Support zone between Sensex 16233-15985 and Nifty 4843-4777 should hold, if the market is to make any further upward price movement. There is a Resistance zone being formed at Sensex 16846-16858 and Nifty 5085-5110 which is a result of the confluence of 38.2% retracement of the immediate fall and the critical 200dma. MACD and ROC continue with their Sell signals and are both negative. RSI (32) has just moved out of the oversold zone but is in Sell mode. While Stochastic Oscillator (%K at 10) is still in oversold and is signaling a Buy since %K is above %D. MFI (25) has moved out of the oversold zone and continues with its Sell signal. ADX has improved and is at 33, which suggest that the downtrend is now strong. Directional Indicators continue in Sell mode as -DI is above +DI. The OBV continue in its Sell mode and so does the Bollinger Band. Nifty O.I. PCR has fallen further to 0.83 which suggests that some pull-back can be expected. Highest open interest buildup is seen at 5200 Call and 4700 Put. On Friday the 5100 Call also has added significant open interest and hence can act as a resistance in the short term. Overall Nifty range is likely to be 4700 on the lower side to 5200 on the higher side. 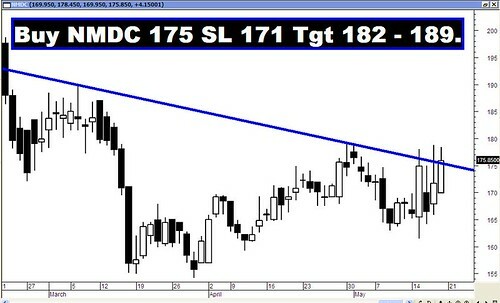 Trendline Resistance for the Sensex is at 16710. The Trendline Support for the Sensex is at 15673. Trendline Resistance for the Nifty is at 5052. The Trendline Support for the Nifty falls at 4847. For the week ahead, Sensex will find Support at 15871-15640-15358 and will find Resistance at 16408-16671-16920. For the week ahead, Nifty will find Support at 4803-4720-4639 and will find Resistance at 4980-5076-5171. All the Recommendations did well. Sun Pharma and Dr.Reddy just missed out on the target. But the Star performer for the week was Orchid Chemicals which went down by an astonishing 24%!! !